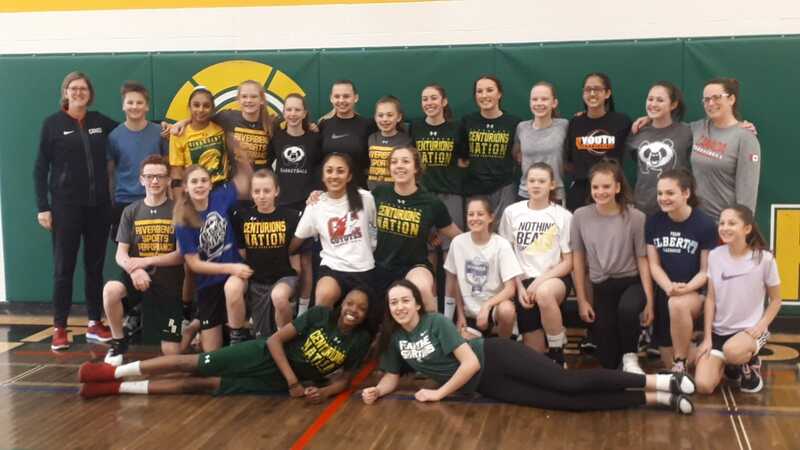 From the Saville Centre to St. Albert, from kids to coaches, the impact was felt far and wide as Canada Basketball held its U16 Women’s Assessment Camp in Edmonton recently. The camp, which took place at the Saville Community Sports Centre, opened March 27 with 20 athletes from across Canada in attendance, including three Alberta provincial team members, St. Albert’s Annacy Palmer and Calgary natives Hannah Riddick and Phillipina Kyei. On their first day, the athletes attending camp spent time with young members of the Ortona Gymnastics Club, with each trying out the other’s sport during a fun afternoon of activities that produced fond memories for all involved. Local coaches had the chance to learn from Jodi Gram, a Canada Basketball coaching veteran. Gram led three clinics over the course of the Assessment Camp, one for a dozen specially identified coaches, and two open clinics that were offered free to anyone who wished to attend, the latter of which drew 20 coaches. A renowned clinician, Gram drew rave reviews from participants in the clinics. March 31 was the all-important final day of camp, and Canada Basketball opened its doors to the public, with an open practice and scrimmage that provided spectators a rare glimpse of the inner-workings of an elite international basketball program. Afterwards, the camp players met with fans and posed for photos with young admirers and their families. After camp concluded, Canada Basketball and Alberta Basketball teamed up for a special day of community outreach. On April 1, Gram was joined by Canada Basketball women’s High Performance Director Denise Dignard along with Concordia men’s head coach and Alberta Basketball Coaching Development Director Reagan Wood for visits to junior high schools J.D. Bracco and Riverbend in Edmonton, and high schools in Sturgeon and St. Albert. Dignard, Gram, and Wood spoke to students and staff about team-building and resiliency during presentations that resonated largely with the audience at each location. Thank you to everyone from Canada Basketball, the Alberta Basketball Association, and the City of Edmonton, who worked to bring the U16 Assessment Camp to Edmonton and make it an impactful occasion for the entire community.